The fifth annual Condé Nast International Luxury Conference was held over two packed days at The Lookout event venue in the V&A Waterfront precinct. The programme focused on ways in which luxury brands can build market share, and discussed the value and promise of Afrocentric luxury. Delegates were treated to a range of high profile speakers from the local and international fashion and tech industries. On behalf of global event company, Vivace, The Events Draping Co. draped the walls and back-of-house at the scenic Lookout. The team first draped the perimeter in white lining fabric, and then over-draped the white in striking bronze chiffon. 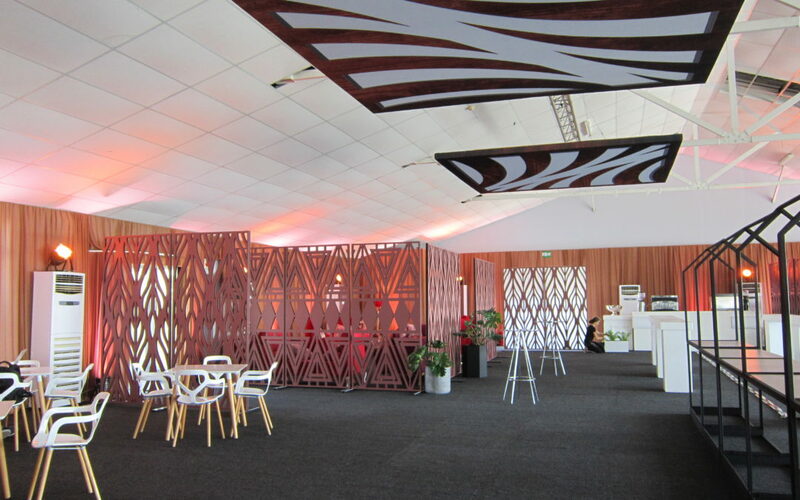 The colour complemented the lovely latticed standing screens and African-inspired ceiling panels by Gear House. Furniture by Urban Tonic.